What can I say about this project? 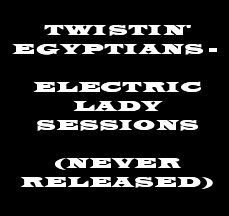 It’s included here even though it was never finished or released because it was such an integral part of what happened to the Twistin’ Egyptians. We were originally going to record this record at Smart Studios in Madison with Butch Vig producing. He went on to produce Nirvana, Soul Asylum, etc… as well as drum for Garbage. Instead, we hooked up with another producer and decided to use him and record at Electric Lady Studios in New York. We were a hot band at the time and bands from Wisconsin were getting signed and doing fairly well nationally (BoDeans, Violent Femmes, Fire Town (Butch Vig’s band at the time), and EIEIO all were signed or doing well at the time). We got to work at a GREAT studio with Bruce Bucchhalter, who engineered with Iron Maiden, The Cars, Hall and Oates, etc…, so it was at least SOME what of a good experience, if not just a GREAT deal of experience with what can go wrong in the music business. Long story short, we got back from New York and RCA called our “manager/producer” at the time to hear the New York recordings. Bruce said he thought it was the best album he EVER worked on and was bringing record guys into Electric Lady to play the rough mixes for them right at the studio. We thought we were going national right up until the time the bottom fell out. Bruce called me one day because the studio wouldn’t release the tapes to him so he could play them for a guy coming in that day from MCA because they supposedly weren’t paid for, but we had paid the recording amount in full to the producer before we began recording. He had taken the missing money from us and we caught him. Right in the middle of all this record company interest we decided to drop our affiliation with the producer we worked with on this project, but we couldn’t get our tapes. That’s when we found out that the producer has as much right to recordings as the band, and the studio wouldn’t release them to either of us without the other’s permission. All record company interest ceased, we were $12,000 in debt for a recording we couldn’t get at and the band split up for a while, reuniting in 1988 and playing through 1990 but never generating this much interest again. Too bad, in 1987 we were a very good band doing the type of music that was very popular and we got THAT close. I can’t be bitter about it, most musicians don’t even get as far as we did, and I AM still playing and recording!